William Donald Schaeffer approached Tom Kerr, head of the old Hampden Business Association, in 1972 to organize the Mayor's Christmas Parade. 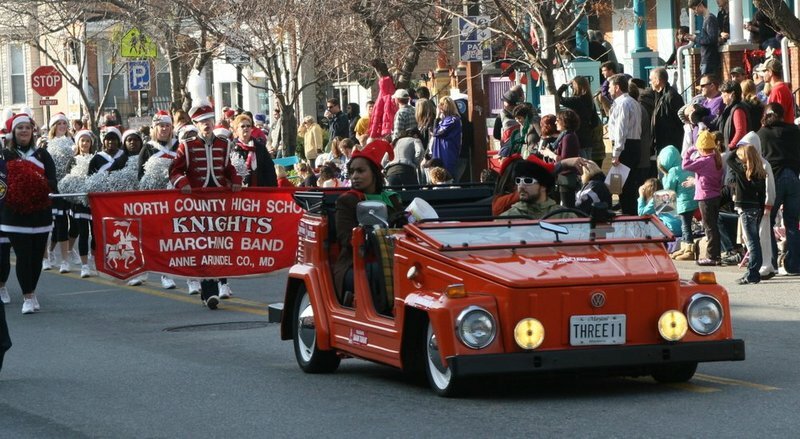 The parade would be Schaeffer's answer to the Hochschild-Kohn Toytown Parade which drew thousands of spectators for thirty years on Thanksgiving Day, but stopped running in 1966. Schaeffer wanted the parade to be held downtown but Kerr insisted on having it in Hampden. Kerr hoped the parade would bring positive attention to Hampden. Mt. Vernon Mill Company closed its last remaining mill in Hampden-Woodberry that year, marking the end of the textile industry in the area. The first parade was far more modest than the department store extravagance of the Toytown parade, and Kerr was only able to secure a single Santa Claus float and six marching bands. Nonetheless, the parade drew a large crowd and was considered a success. As of 2013, Kerr has been organizing the event for forty-one years. Every year the parade elects a Grand Marshall. Past prominent figures to hold the title include baseball legend Brooks Robinson in 1978, and more recently, John Astin, famous for his role as Gomez in The Addams Family. Schaeffer made a number of appearances as mayor and came back as Grand Marshall after becoming governor. In 1980, spectators were baffled to see his yellow Cadillac moving toward Thirty-sixth Street without him. The convertible left while he was giving a speech and he quickly darted across the street, ran through an alley, and ducked under a police barrier to cut off the ride for his own parade. Today, the two-and-a-half mile long parade attracts nearly 25,000 spectators, 160 marching units, and a variety of eclectic floats. Although the parade has grown, it continues to be a community effort. Ninety-five percent of Hampden businesses donate money to the parade. Kerr, who is locally known as the unofficial mayor of Hampden, has recently expressed interest in stepping down from his position, but doubts he will ever be completely detached from the parade. Nathan Dennies, “Mayor's Christmas Parade,” Explore Baltimore Heritage, accessed April 23, 2019, https://explore.baltimoreheritage.org/items/show/320. Published on Dec 9, 2013. Last updated on Nov 27, 2018.